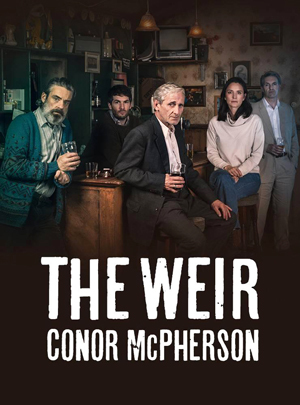 Conor McPherson's award-winning modern classic, The Weir tells the story of storytelling. Oral storytelling is something that is as old as the hills, and our stories, our superstitions, beliefs, and even our customs and language have all been passed on from generation to generation through this medium. A medium that you might think in our modern day of alternative communications and technology would be lost or at least on the decline. Not so in a remote village community in rural Ireland. The local pub is the place for such stories, and as the men folk use this pub as their source of entertainment they delight in telling stories and bantering with each other over a pint. McPherson's play isn't about grandeur or trying to make a sweeping political statement as some plays do, but instead chooses to focus on the little things. The seemingly insignificant builds an astoundingly real picture of the people who populate that pub; their fears, their loneliness, their superstitions, and all these things are what bring them all together and make them human. The play also shows how these men react when a beautiful young woman is brought into their midst. They are obviously not used to such a happenstance. It is a very real and honest play, and yet, the subject for the conversations is distinctly other-worldly. Ghost story it isn't, but the theme of the storytelling in the pub that evening is ghosts, and as one story flows to another these five disparate characters reveal that they have more in common with each other than they would perhaps be happy to admit. The young bar owner Brendan (Sam O'Mahony) contrasted beautifully with the old-timer Jack (Sean Murray), and as they sparred with each other verbally for both being single, overheard by the more timid Jim (John O'Dowd), in walks the flash and oh-so-full-of-himself Finbar (Louis Dempsey) with the young lady from Dublin to accompany him, Valerie (Natalie Radmall-Quirke). The five were excellently chosen and the chemistry between them was at times electric, all giving Oscar-worthy performances. The long monologues were superbly measured and I haven't been so impressed by such clever use of pauses since Pinter! Director Adele Thomas crafted this seemingly very simple piece into a rather tense suspense drama. We were all the time waiting for the moment of catharsis, when a skeleton would fall from the ceiling, or a poltergeist would move the tables, but of course, nothing of the sort would or did happen. This was real life and as such allowed our imaginations to do the wandering in this vein. Very clever. The cathartic moments come as each character reveals more and more about themselves through the stories they tell. Storytelling is an art, and English Touring Theatre have just perfected it. However, there were two things in this evening's production which concerned me. The first was the lighting. I was distracted by it and it pulled my focus on several occasions. Designed by Lee Curran, the start and end of the play were given over to unnecessary flashing theatricals which added nothing to the play or mood, whilst during the play which is a continuous flow of action, the bar lights would dim or brighten or cast people in semi-darkness or cast the main speaker's shadow in a distracting fashion. I found all of this odd. I understand that what Curran was trying to do was to add mood and tension to the play by focussing our attention on the storyteller and not the peripherals. However, for me at least, I found this both annoying and distracting. The second thing concerned the accents. The four men from a village near Carrick; our rural Irish 'hicks', all had lovely accents which made their characters and situation all the more real and enjoyable. However, I was uncertain that a standard RP English accent was the correct way to go for Valerie. A Dublin accent would have been enough to separate her surely? It somehow lost something by not keeping the dialogue Ireland specific. However, these personal preferences notwithstanding, the 100 minute play (no interval) was excellently observed and proves beyond doubt that the noble art of oral storytelling is definitely not dead.